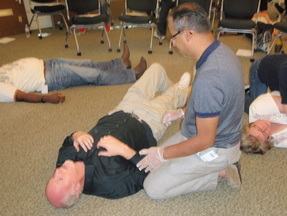 Companies trust NwBestCPR to provide the most up to date engaging safety training in Seattle. What would you do if a coworker collapases... What if it's you? What if a co-worker fainted at work? HOPEFULLY NO HEART ATTACK, ALLERGIC REACTION OR BLOCKED AIRWAY INTERRUPTS YOUR WORK DAY AT EDIFECS. IF SUCH AN INCIDENT OR ACCIDENT SHOULD OCCUR, THOUGH, TAKE HEART. MANY OF YOUR COLLEAGUES NOW UNDERSTAND WHAT TO DO IN THE PRECIOUS MOMENTS BETWEEN THAT INITIAL CALL TO 911 AND THE ARRIVAL OF THE PARAMEDICS. TWENTY-EIGHT EDIFECS ASSOCIATES ATTENDED A FOUR-HOUR TRAINING LED BY INSTRUCTOR FARLEY KAUTZ ON A RECENT FRIDAY IN THE TWILIGHT BUILDING. AMONG THE SUBJECTS COVERED WERE CPR, GENERAL FIRST-AID AND DE-FIBRILLATION. 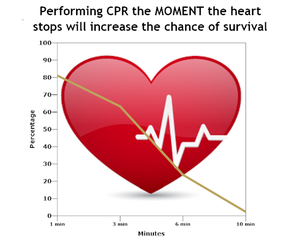 NWBESTCPR'S CURRICULUM IS DRAWN DIRECTLY FROM THE PROTOCOLS ESTABLISHED BY THE AMERICAN HEART ASSOCIATION BUT AS ANY BORED STUDENT KNOWS, IT’S NOT SO MUCH WHAT’S TAUGHT AS WHO’S TEACHING. KAUTZ LEAVENS THE LESSONS WITH WIT, STORIES, PLENTIFUL DRILLS AND EXERCISES PLUS SNAPPY ENGAGEMENT. NWBESTCPR TRAINING OFFERS COURSES BOTH ON COLLEGE CAMPUSES AND ON THE CAMPUSES OF AREA COMPANIES. IT’S COMMON—BUT DANGEROUS—TO ASSUME YOU DON’T NEED EMERGENCY TRAINING IN AN AREA THAT’S RIFE WITH FIRST-RATE HOSPITALS. “YOU'VE GOT THREE MINUTES ONCE A HEART ATTACK OCCURS TO INTERVENE,” KAUTZ SAYS. “SUPPOSE THE PARAMEDICS TAKE SEVEN? NOT JUST SURVIVAL DEPENDS ON RAPID RESPONSE—THERE’S THE QUALITY OF LIFE THE PERSON CAN EXPECT AFTERWARD.” KAUTZ FIRST STARTED TEACHING EMERGENCY SKILLS 20 YEARS AGO WHILE OPERATING AN OUTDOOR ADVENTURE COMPANY IN COLORADO. SINCE THEN HE’S OFFERED THE POPULAR COURSE TO THOUSANDS OF INDIVIDUALS ACROSS THE COUNTRY. WHILE THIS CLASS FILLED QUICKLY, MORE WILL LIKELY BE SCHEDULED IN THE NEAR FUTURE. OPERATIONS’ TUSHAR PATEL SAYS THE FOCUS ON SAFETY IS JUST ONE OF THE MANY INITIATIVES HIS DEPARTMENT IS ROLLING OUT IN COMING MONTHS. ​What other companies say about NwBestCPR training. Could you perform CPR on a friend immediately?